Citizens line up to take their turn at the podium during public comments at a Feb. 28 special meeting of the Montezuma County Commission. At the meeting, the commissioners voted 3-0 to pass a resolution calling the county a “sanctuary county” for gun rights. 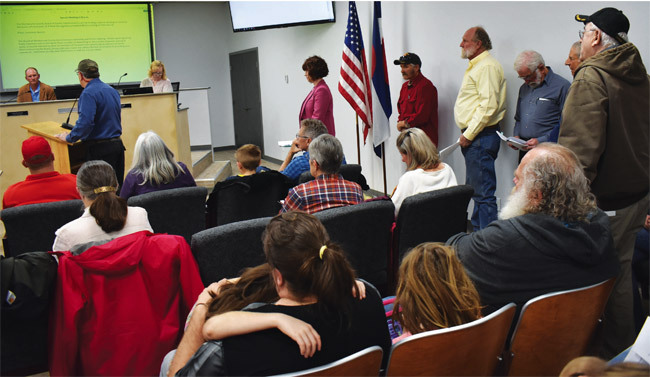 Cheered on by an overflow audience deeply concerned about gun rights, the Montezuma County commissioners on Feb. 28 unanimously passed a resolution aimed at opposing Colorado’s “red-flag” legislation. “Montezuma County, Colorado, is a Sanctuary County for the Constitutional right to keep and bear arms,” the resolution states. The measure has no legal impact, but was designed to send a message to the Colorado General Assembly, which appeared likely to pass a bill allowing for the temporary seizure of guns from disturbed people. He noted that the county sheriff is independently elected and the commissioners can’t dictate how he does his job. Also, the city of Cortez has its own police department and the town of Mancos has its own marshal’s office, which operate without county oversight. But despite the fact that the resolution was symbolic, it generated an enormous amount of interest, reflecting the fears that have been sparked in rural Colorado by HB 19-1177. At press time it had passed the state House and was headed to the Senate. There was never any doubt that the commissioners would pass some sort of resolution voicing opposition to the bill – the only question was which of three draft measures they would choose to support. A number of people addressed the resolution, most in favor of it. The text of that resolution, however, did not mention the word “sanctuary,” and Commissioner Larry Don Suckla wanted the word included. “Why do we have sanctuary cities all over this country for illegal immigrants?” he asked. Sheriff Steve Nowlin said he strongly supports gun rights, but voiced concern about signing on to a resolution that would indicate he wouldn’t enforce a law passed by the Colorado legislature. He noted that his oath of office commits him to follow the constitution and state law both. “My feeling is the commissioners don’t have the authority to bind you to anything,” Baxter told Nowlin at the Feb. 26 meeting. Without the sheriff ’s endorsement of the resolution, he said, “I don’t think legally we have a lot of ground to stand on” in trying to force the sheriff not to enforce red-flag laws. Montezuma County was reportedly the second county to pass such a resolution in Colorado, after Fremont County, and other counties were considering similar options. A number of counties in other states have passed measures calling themselves gun sanctuaries. Candelaria’s motion died for lack of a second. Candelaria asked for time to study the new draft, and the board opted to hold a special meeting on the issue the evening of Thursday, Feb. 28. That gathering drew well over 100 people to the commissioners’ meeting room – many of whom had seldom if ever attended a commission meeting before. Some additional people spilled over into the county annex, which was set up for video viewing of the meeting. More than 30 citizens spoke during public comment. Most supported approving the second or third resolution. Amanda Winter of Dolores said the red-flag legislation means “anyone with a vindictive ex” would be in danger of having their guns taken away. “It’s not going to stop until the people stand up and take a stand, and we ought to thank the commissioners for taking that stand,” said Robert Smith of Road 20. Dexter Gill of Lewis agreed, saying there are other ways “through the mental system” to handle a situation where people are threatening to harm themselves or others. But some citizens spoke in opposition to the resolution. “Just imagine the chaos if everyone only followed the laws they agreed with,” said Ellen Foster of Dolores. County resident Janet Hough said she believes HB 1177 will help prevent gun violence, particularly suicides. She said 68 percent of suicides in Montezuma County, and half of those statewide, are committed with firearms. County resident Rebecca Busic said she worried about the precedent the commission was setting and said a future commission – which might be more progressive in nature – could look back to this resolution and use it as the basis for declaring the county an “anti-fracking sanctuary” or something similar. He said he doesn’t see the need for HB 1177 because the system already works to save lives and protect families when someone is considering committing gun violence. He said he was willing to sign the original resolution that didn’t contain the word. In the ensuing board discussion, Candelaria and Commissioner Keenan Ertel indicated they were favoring the third option because of its support for broad constitutional rights. But Suckla made a motion to pass the second option instead, the one naming the county a sanctuary for the right to keep and bear arms. There was then some confusion as to which resolution had been approved, as all of them carried the same number. So the board went through the process a second time, with Suckla making the same motion, Candelaria seconding it, and all three voting in favor. Suckla said he would also like to create and pass a county ordinance, a measure that does have the effect of law. He said he understood that there was confusion about what sort of ordinance he had been calling for at the end of the meeting. “It was pretty loud in there,” he said.